Our product range includes a wide range of papad packing bags. We have been affianced to offer an excellent grade array of Papad Packing Bags. These bags are used for packing papad exclusively. Clients also use the bags for packing small raw pizza, kulchas and other food products. The offered bags are manufactured following the food industry guidelines that enable the bags loaded with safety, fresh and high durability properties. 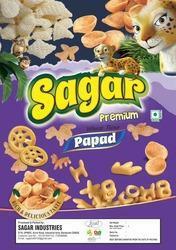 Papad packed in the bags remain fresh and healthy for a longer time. The sides of the bags are tightly laminated and closed during the fabrication.